The West Linn girls snowboard team may have been small in numbers, but the Lions were great in every other way. West Linn's girls — Ava Paul, Kyli Miller, Averie McCurry and Ashley Chon — competed in the Oregon Interscholastic Snowboard Association state meet at Mt. Hood Meadows from March 13-16 and came through big-time. 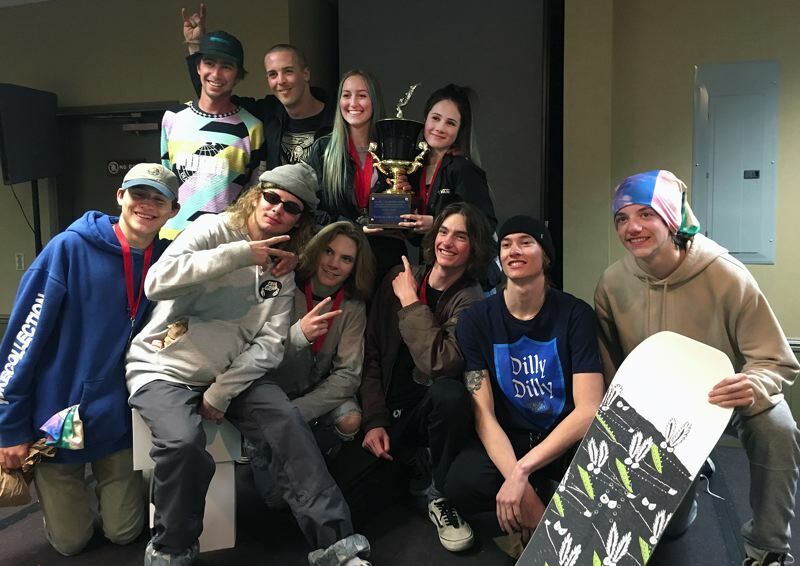 West Linn's girls won the snowboard cross event, finished second in the slopestyle competition, took third in the banked slalom and grabbed fourth in the halfpipe to secure the 2019 Sato Cup as the state's top team. The Lion girls kicked off the week of state competition by notching a third-place finish in the Wednesday, March 13, banked slalom with a team score of 922 points; the Lions trailed just first-place Wilson's 1,115 and runner-up Lincoln's 925 in the final standings. West Linn did it with Paul coming through to place third with a time of 53.294 seconds; she was followed by teammates Miller (18th at 1:00.355), Chon (30th at 1:16.093) and McCurry (31st at 1:17.051). In the boys banked slalom, West Linn's boys placed sixth with a team score of 493 points; Hood River took top honors in the event at 2,190. Leading the Lions in the event were Evan Potter (15th at 48.43), Ashton Bowerly (22nd at 49.281), Gavin Campbell (25th at 49.521) and Blane Burton (27th at 49.679). In the boys boardercross event on Thursday, March 14, West Linn's boys ruled the mountain, taking first with 1,336 points to edge second-place Hood River's 1,320 by the slimmest of margins. Burton was the leader there, taking first place in the field of 64. He had plenty of help, too, with Campbell placing 14th, followed by Potter in 26th and Bowerly in 48th. The West Linn girls matched their male counterparts, winning their boardercross event with 1,220 points while second-place Ashland was far behind at 890. The Lions manufactured their win with just two riders, Paul taking first in the field of 32 while Miller grabbed 12th overall. In the girls slopestyle competition on Friday, March 15, the West Linn girls stepped up to finish second with a team total of 428 points, while Sandy took first in the event at 460. The Lions sent three riders into the competition, with Paul and Miller placing 10th and 11th, while McCurry finished 28th overall. Paul did not finish her first run, but scored 155 on her second try to place 10th, while Miller was close behind with 154 points on her first run (she failed to complete her second run) and McCurry ended with 119. In the boys slopestyle, West Linn sent nine riders into the competition and placed fifth as a team with 872 points. Hood River's boys placed first at 1,080 points. The Lions' four scorers in that event were: Potter (eighth at 264 points); Bowerly (26th at 216); Ronen Retzlaff (38th at 198) and Lucas O'Doud-Vega (40th at 194). In the boys halfpipe competition on Saturday, March 16, West Linn was a solid second among 18 teams, finishing with 716 points and trailing only state champion Hood River's 735. The Lions were led there by Potter's third-place finish with 217 points. His teammates included Burton (10th at 179), Elliott Avery (13th at 164) and Campbell (18th at 156). In the girls halfpipe, the Lions finished fourth among seven teams, racking up 300 points and trailing Sandy's 586, Lake Oswego's 388 and La Salle's 358. Paul stepped up there for West Linn, finishing second overall with a best score of 183 for her two runs; she trailed only Astri Lommen of Cleveland and her winning total of 213. McCurry placed 17th with 117 points. Also competing for West Linn at state were Will Craig, Asher Isaacson, Peter Moller, Derek Pickett and Tanner Southwick. The Lions are coached by Kevin Holmes, Nicky McMillen and Joey McMillen.